learn the observational skills of professional Bike Fitters and how to take simple measurements to do your own Dynamic Bike Fits. Instead of hanging plumblines or placing heels on pedals, see how different pieces of information come together to define the ideal locations of the bike's contact points. 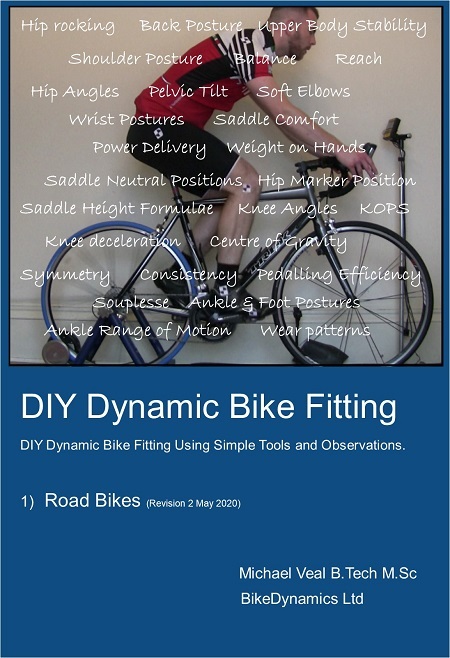 45 Page PDF download describing all the observations, simple measurements and calculations required to do your own Dynamic Bike Fits. British Pound, Euro and US Dollar payments are processed by PayPal and all major credit cards are accepted. You will receive an email confirming your payment and will be automatically redirected to a page where you can download the ebook. The ebook is in PDF format so you will need to have a copy of Adobe Acrobat Reader or a similar PDF reader to read the ebook. The little 45 page book http://bikedynamics.co.uk/shop.htm is a treasure and really raises your awareness. There may only be 45 pages of information - but it's because it cuts out the BS and brings the benefit of a huge amount of experience. There is a clear avoidance of impractical "perfection" - yet the recognition that when you find your optimum even a couple of millimetres can make a huge difference. Thanks for a fantastic DIY guide – I (slightly) injured my knee last week due to a combination of a new saddle (12mm lower height from the pad to the bars), sitting further forwards on a seat set up with a ~5 degree slope, and tight winter leggings. I’ve sorted each problem out, and your guide has allowed me to check a new seat height set-up and to measure the impact of forward/back position on the inclined saddle in less time than it would have taken to get down to my LBS for a fit. Thank you for publishing your wonderful bike fit guide. This has answered many questions I used to have on bike set up. I must admit I have not gone through the whole process as you describe, but even following a few of your pointers I am already far more comfortable. © 2016 BikeDynamics Ltd. All Rights Reserved.